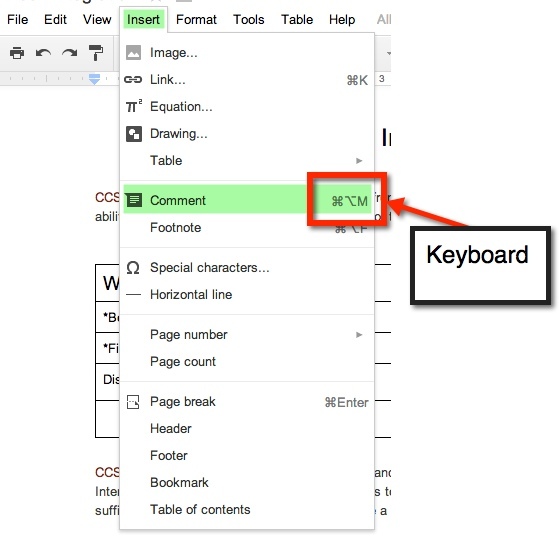 Another feature that allows for easy collaboration in Google Documents is the ‘Comment Feature’. This feature allows me to highlight a particular text and comment on it, for clarification or questions. It’s really very easy. First, highlight the desired text (can be a word, phrase, sentence). 4. Gray Comments button next to Share button on top right. A yellow comment box will appear to the right of the document. This is where you will type your comment. If more than one comment is on the document, and you are unsure of which comment goes to which highlight, simply click on either the comment or the highlighted section. If the highlighted text is chosen, then the comment will ‘pop up’ and show in the yellow box. If the comment is chosen, the highlighted text will become a darker yellow. When you have finished making your comment, be sure to chose the blue comment button. This entry was posted in Blog Contest, Classroom, Google, How To and tagged comments, Google, Google Docs by Admin. Bookmark the permalink.